What does it mean when a cruise ship completes its conveyance? 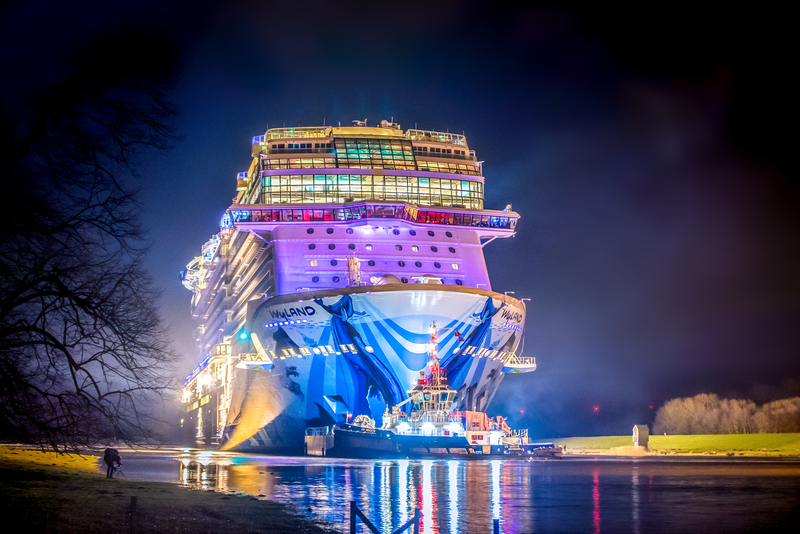 The news came out of Norwegian Cruise Line yesterday that their latest ship, Norwegian Bliss, had completed its conveyance up the River Ems from Papenburg in Germany to Eemshaven in the Netherlands – meaning it is one step closer to its expected delivery date of April 19. This, naturally, prompted a nation of cruise lovers to ask: just what is a conveyance? While most commonly associated with the legal process for transferring property from one owner to another – and adding another wedge of cash to your solicitor’s wallet in the process – in the ship industry a conveyance is the act of moving a ship from an inland shipyard to a coastal port. This occurs almost exclusively for ships built at the Meyer Werft shipyard in Papenburg, Germany, which is unconventionally placed 32 kilometres inland so as to avoid the worst conditions that the North Sea has to throw at them. In an interesting twist, this process occurs with the ship manoeuvring backwards down the river as it grants more control and, if the worst happens, allows some protection to the propellers which will remain in the centre of the river. The whole 32km journey took Royal Caribbean’s Quantum of the Seas over ten hours to complete back in 2016 – meaning someone with a brisk walk and plenty of fitness could walk the journey to the final destination quicker – but can be achieved much quicker depending on the size of the ship and the weather conditions. So, in the case of Norwegian Bliss, which measures 994 feet long, 136 feet wide, and at a gross registered tonnage of 168,028, just getting through Meyer Werft’s sea lock (where there is less than four foot of clearance) took just less than two hours at a speed of only 0.2 knots. It’s no small feat and is probably why when the operation is completed cruise lines like to shout about it. Who can blame them!